I went on my favourite winter vacation by accident. After a website glitch nixed my Mexican canyon group adventure departing from Phoenix, I’d already set my sights on Arizona for other reasons and booked a few side trips there. There was no turning back, so I shortened my itinerary. The Grand Canyon should be part of anyone’s bucket list as one of the great natural wonders of the world. Then, there’s Sedona with its mix of red rock flat top hills and New Age mysticism. 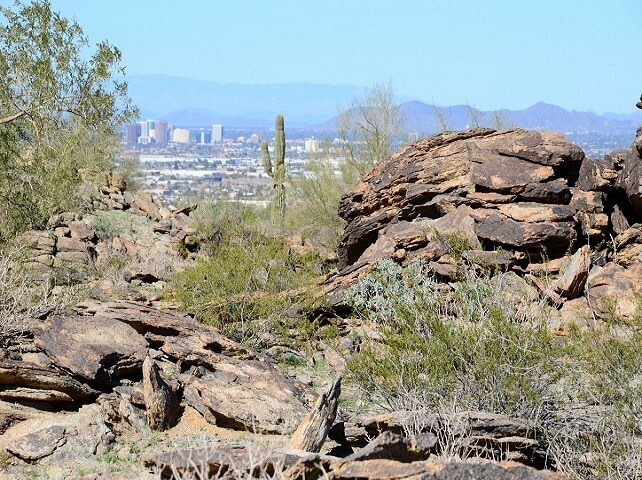 Phoenix has several hiking trails, such as those in Camelback Mountain and South Mountain Park, along with the Desert Botanical Gardens, restaurants, museums, shopping and entertainment. 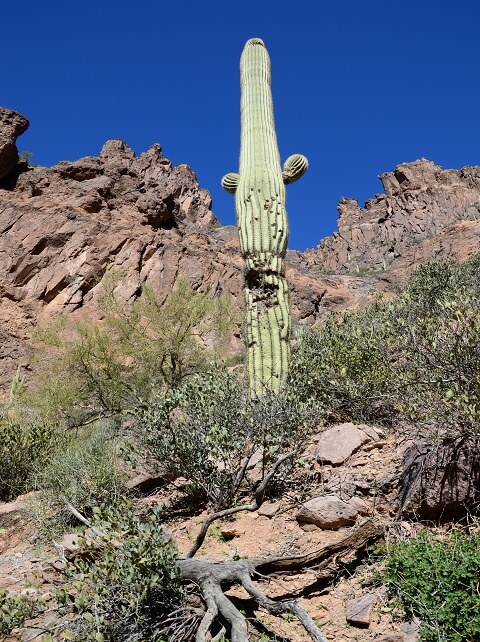 Finally, the Apache Trail just east of Phoenix features breathtaking drives and Lone Dutchman State Park, with trails for anyone from beginners to experienced hikers. Most of my trip was solo, though I met people once I got to my destinations. I’m a day hiker. My fitness level is beginner to moderate. 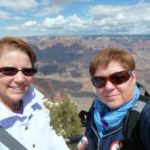 Nevertheless, I decided to see the Grand Canyon on foot, instead of riding, driving or taking a helicopter, because it would feel more up close and personal. I love a challenge. However, I also prefer to walk normally at the end of it, so I set a goal I could reach and trained for it every day for two weeks. 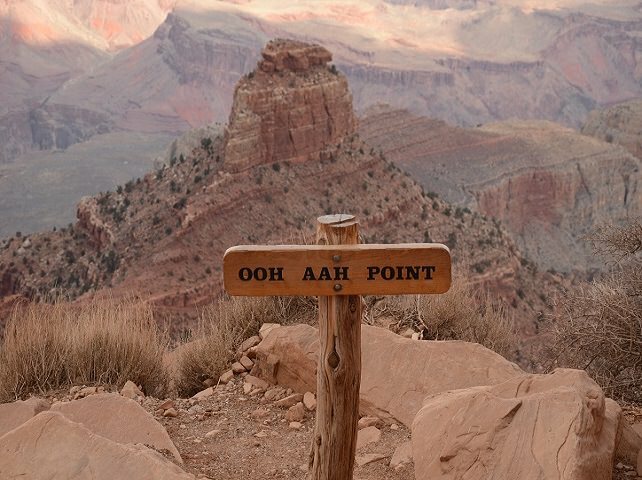 I chose the South Kaibab Trail to Cedar Ridge, a 2.8 mile round half-day trip with an elevation loss of 1,150 feet. 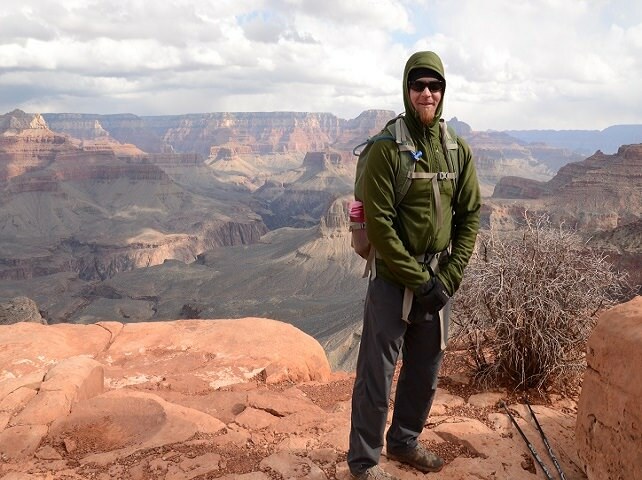 Though a winter hike in the Grand Canyon is an exhilarating experience and a refreshing contrast to summer heat waves, Northern Arizona in February can resemble any Canadian location: snowstorms are common, including whiteout conditions, and can close down highways into the park. 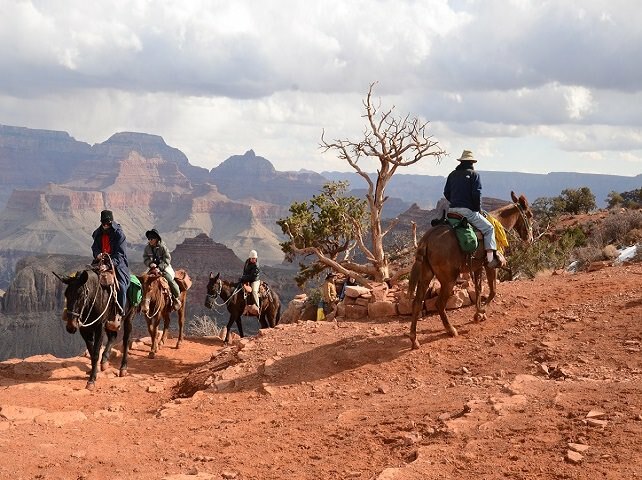 The North Rim closes to visitors from December to mid-May, except for those with backcountry permits. Even at the South Rim, visibility can drop to zero and heavy snow can close highways. I steeled myself for all conditions, bringing several layers of clothes including waterproof gear and a pair of gaiters for my hiking boots. Above all, I brought my Nikon D7000. There are several types of accommodations in Grand Canyon National Park itself, but I stayed in nearby Flagstaff in case snow closed the roads on the day of my flight. The Four Seasons Guides Southwest tour company picked me up in the morning. As we drove up to the park, my guide Bob Cheeseman and I discussed everything from the local Ponderosa pines to park history and latter-day student protests against the restart of copper mining. 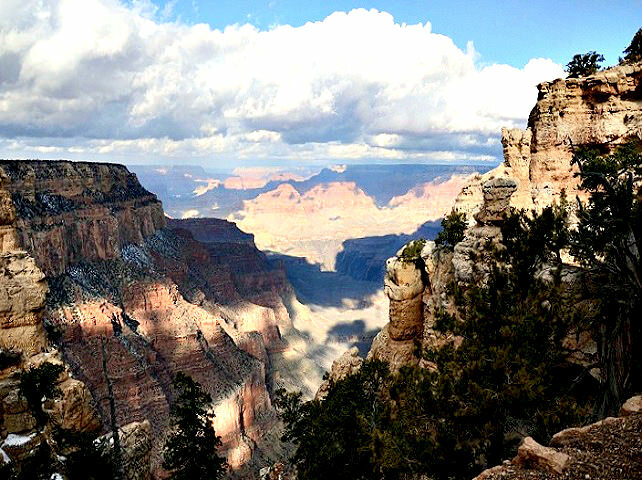 The Grand Canyon is one of the oldest in the National Park Service, designated in 1919. It gets five million visitors a year. Most of these don’t show up in February: another advantage to winter visits. The park has recorded over 4,300 archeological resources, with the oldest found human remains date back almost 12,000 years. 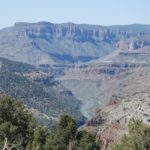 The deepest part of the Canyon is 6,000 vertical feet from rim to river. As for land area, it covers over a million acres. When we arrived, facts and figures failed in the face of the majesty of the Canyon itself. We were lucky: the sun shone all day despite near freezing temperatures and dire snowfall warnings. Throughout the hike, clouds spread perpetually moving shadows across the crags and plateau before us, creating multiple shifting panoramas of successively more stunning beauty. Bob had all the gear we needed: crampons, walking sticks and plenty of bottled water, along with sandwiches for lunch and trail mix snacks. Conditions were icy at the rim. A few tourists wandered by, including shivering girls from Brazil in open-toed sandals who wondered aloud if they should wander into the trail. They turned back quickly. Two hundred feet further down, I doffed my winter coat and stuffed it in the backpacks. I scoffed at the wide, manicured trail as overly tame for my hiking tastes, until Bob quickly reminded me that many a visitor had backed up for the perfect picture only to end a trip with a several-thousand-foot fall. I was glad he was there. We spotted little wildlife, except for a few hardy gray jays refusing to winter elsewhere. As Bob described the surrounding vegetation, the agave got my attention: the plant only flowers once, after a few decades of existence, then dies. It’s like the salmon of desert flora. The succulent is most popular in a drink called pulque or its distilled counterpart, mescal, but its nectar has a reputation as a natural sweetener. Most of us would have encountered its relative, blue agave, by drinking tequila. Unfortunately, agave isn’t all sunshine: it’s also classified as invasive in many habitats. On the way down, Bob and I crossed a donkey caravan climbing back up. I’d heard donkey rides are rougher on the human posterior than going on horseback; nevertheless, they’re a popular alternative to hiking. Once we got to Cedar Ridge, the way back up was harder, and slower, than I’d anticipated even with my preparation. Bob encouraged me by insisting it was only a few more minutes to the top. An hour later, he was right. I’d accomplished my goal. 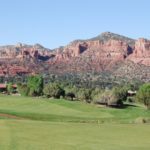 The next day, I took my rental car down Highway 89A to Sedona. Snow blanketed the town and the road, making driving an adventure, especially with all-season radials. 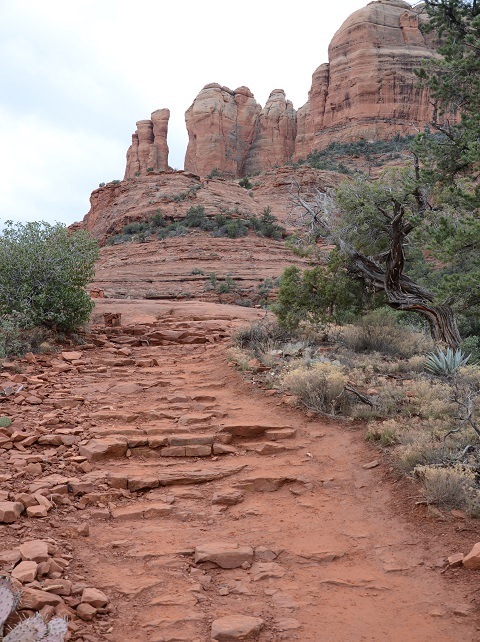 I headed to two of the fabled red rock hiking trails: Little Horse Trail and Cathedral Rock. Sedona itself is a magnet for spiritual seekers, but the more secular minded will find a hiker’s paradise even without the mysticism. There are over 80 listed trails in the area along with several unofficial ones. 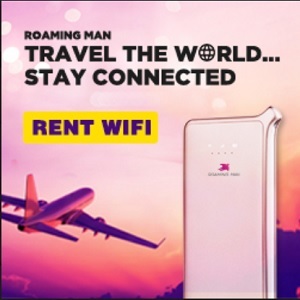 Exploring them all will take several return trips. Cathedral Rock is the most popular hiking spot in Sedona and speaks to both body and soul: the trail starting at Back O’ Beyond Road, off Highway 179, is a strenuous, 1.5 mile 600-foot rock climb, while the site is one of Sedona’s four “vortexes” alongside Bell Rock, Airport Mesa and Boynton Canyon. The vortexes are said to amplify energy and help concentrate prayer, meditation and healing. To take full advantage of their presence, many hikers grow quiet and meditate. The trail up to Cathedral Rock offers stunning views of Red Rock State Park. It’s best to scale the rock itself in dry weather, since the rock face is very smooth. As I wound my way up, a long line of tourists in single file snaked across the narrow passage to the very top, despite the off-season time of year. Next on my itinerary: the Phoenix area. My first hiking experience is along the Apache Trail on Highway 88, with its lakes, canyons and hairpin turns. Lost Dutchman State Park, near the Superstition Mountains, has six trails ranging from 0.7 to 5.8 miles, ranked easy to difficult. The park got its name from an Arizona legend: German prospector Jacob Walz, who died with rich gold ore hidden under his bed. Many searched for the source, but the mine was never found. The stately saguaros capture my imagination. It can take fifty years for one of these august cactus plants to sprout a single arm. Some never acquire another, while many spout several over hundreds of years. Their strangely histrionic shapes stand guard over us as we wind our way up to the trailheads and beyond. I head up the rough winding path of the Siphon Draw trail, crossing several other hikers. The stark yet striking landscape dotted with cacti and desert brush enchants me. I make it up to the Basin, at the end of the marked trail, a four mile round trip. The Flatiron is almost another mile away, over 1,700 feet higher, or more than twice the 1,200 feet I’ve already climbed. Experienced hikers have to find their own way up without signs or flags to show the way. Since my feet throb with blisters, I rest then turn back. Further along the Apache Trail lies the village of Tortilla Flat, with its population of six. 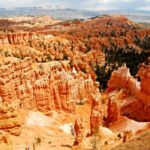 To get there, I drive along breathtaking turns with saguaro-dotted hillsides, dramatic desert canyons and turquoise lakes. I stop at a scenic viewpoint near Canyon Lake, one of three man-made reservoir lakes formed on the Salt River south of Roosevelt Dam. Despite temperatures in the mid-70s, the marina lies deserted and the lake is still. Even here, there are no winter water sports. At Tortilla Flat, the road to the Hoover Dam is flooded: even a 4×4 won’t make it through. I stop at the local restaurant on the main street and order a burger. The few other tourists who’ve wandered in are friendly, as is the staff: though it’s a perfect day for a drive, we form a bit of an exclusive club. As I drive back to Phoenix, I catch the setting sun on Apache Junction. On my last full day in Phoenix, I want to hike a bit of South Mountain Park. As the largest municipal park in the country at 15,000 acres, it holds 51 miles of primary trails for everything from horseback riding to biking. Visitors can drive to Dobbins Lookout, the highest point in the park at 2,330 feet, from the main entrance off South Central Avenue. However, I stick close to the house and pick the Mormon Trail off 24th Street. The trail is steep and fairly well groomed and marked until the very top. Most people I run across wear open-toed sandals to walk their dogs or even go for a run. I sweat in my hiking boots but prefer the ankle support. I hike for just over an hour. It’s a good enough workout for me after my day at Lost Dutchman, though others on the trail head to Hidden Valley with its tunnels and dry waterfalls. I’m glad I’ve brought a lot of water. From the top of the mountain, Phoenix sprawls out with only a few skyscrapers clustered in the distance like Martian stalagmites. Brown desert bakes in the sun, dotted by green saguaros and desert brush. When I get back to the house, Alana’s in the kitchen. I brush sweat off my forehead and comment on the heat: 75 degrees. She chuckles and tells me to come back in July. 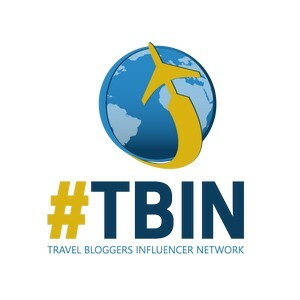 There are several other hiking opportunities in and around Phoenix, all excellent in the winter months: Piestewa Peak, Camelback Mountain, Thunderbird and Tom’s Thumb, to name only a few. All in all, winter is an excellent time for hiking in the area: bearable temperatures and no tarantulas or rattlesnakes. There are also fewer people on the trails, as peak season is early spring and fall. Phoenix also offers many restaurants, museums, theaters and music venues to choose from when unwinding after a hike. The Desert Botanical Garden are a great resource for anyone curious about those many cacti. Dominique Millette is a Toronto-based bilingual author and translator, as well as a freelance writer. She has worked in several weekly newspapers and written and published a novel in French (La Delphinée), one theatrical monologue and several short stories. One of these, “Oomblaug Day”, was published in Parsec magazine. Another, “Better than Elvis”, was published in Maisonneuve magazine. She has also studied with Joan Barfoot at the Humber School of Creative Writing. Do you have groups that hike the Smokey Mountains? I’ve hiked the Grand Titans and Yellowstone Park along with hiking in Missouri every weekend. 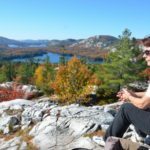 Please send some info on tours, costs and areas for women to hike in USA.